Eating healthy can be both time consuming and costly. However, even if you’re on a low budget it’s possible to improve your lifestyle and live a healthier life. Today I’m sharing 25 healthy eating hacks for those who have a limited budget! Let’s dive in! Have you ever noticed that if you’re shopping hungry, you tend to buy so many more sugary snacks? A rumbling tummy and getting your groceries isn’t exactly a great combination. In fact, there was a study done that shows that hungry buyers tend to purchase products that are higher in calories. That’s especially when it comes to high-carb, high-sugar foods. When your body is deprived of food, it searches for the fastest way to get the energy. Therefore, you start craving for sweets and other simple carb foods that would provide with the quick energy your body needs. Also, the supermarkets are designed in a way to lure us to buy more. And, with a rumbling tummy, it’s much harder to stay away from the colorful treats! So, have a hefty meal before you go shopping. In that way, you’ll be able to make more organized and healthier buying choices. There are a couple reasons why you should always go shopping late. First of all, you’re probably going to save time from standing in the queues. Secondly, you’ll have a much easier time choosing what you want to buy since the shops are emptier at that time. Thirdly, you’re going to save a lot of money! Why? Well, most of the clearances happen late in the evening, so that’s the best time to get much cheaper meats, vegetables, and dairy products. The only thing to remember is that those products are going to expire much sooner. Thus, you want to buy groceries just for a couple of the upcoming days. Seasonal food is cheaper and more nutritious. It’s more nutritious because these foods are picked when they’re ripe. Unlike the foods out of season. Most seasonal food is also local which means that it doesn’t have to drive long distances to get to you. So, the farmers don’t really have to use different chemicals to keep them in good condition for longer. Also, when you have a lot of one vegetable or fruit, the prices tend to go down due to competition between farmers or markets. Also, this food needs to be sold as quickly as possible, so it doesn’t go bad. So, do include seasonal food into your diet, because you’re going to save a ton of money and have a much more nutritious diet. 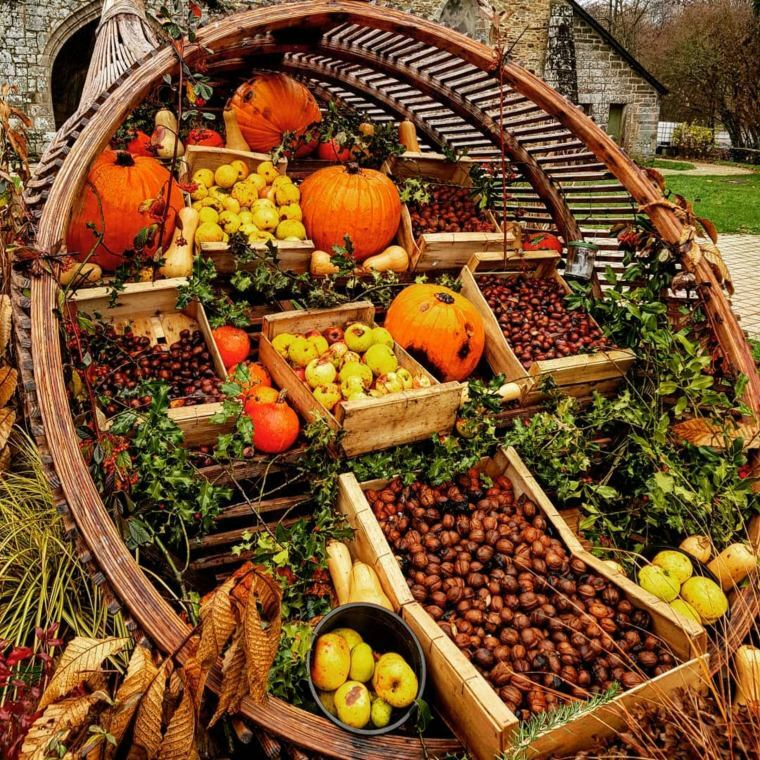 Autumn: apples, pears, cranberries, brussels sprouts, pumpkin, mushrooms. Sales are everything when it comes to food! If you notice a sale on some of the goodies that you know are going to last long such as rice, oatmeal, noodles, oil or canned foods, use it to stack up for the month. Who knows when the next sale will come but these foods will last on your shelves for a long time. So, there is truly no reason not to buy them. Also, you might need to spend just a bit over your budget for that month in order to save some money next month. So, do have that in mind in case you’re tight on cash. You can save quite a bit of money when buying cheaper meat cuts. Some of these include beef, pork, chicken and lamb. While these cuts will probably not do for a perfectly cooked steak, you can use them for stews, salads and other simpler dishes. Also, when you’re looking for cuts of meat, focus on buying lean mince so it has less fat. Always look for meatier cuts rather the ones that have a lot of fat. Studies suggest that cooking at home is both healthier and cheaper. When you cook your own food, you can control precisely how much oil and sugar you add to your dishes. Also, you don’t have to pay anyone for the hours it takes to cook all of that food for you. So, definitely cook at home as much as you can if you’re tight on budget. Frozen fruits and vegetables often have discounts but also, they tend to be cheaper. The best part of buying frozen goodies is that you can store them for a long time. So, whenever there is a discount for some veggies or fruits, buy in bulk! Another great feature about frozen goodies is that they tend to be more nutritious. These vegetables and fruits get frozen during the season when they’re the best. Thus, you better off cooking frozen food during winter or autumn, because it’s going to be more nutritious than other imported veggies. Growing your own food is time-consuming. And while for some it could be a great way to spend their free time, for others it’s just a hassle. However, one thing stands strong – having your own garden to grow veggies and fruits can save you a ton of money! It’s up to you whether you want to invest that time into it or not. Having lunch at work can become costly with time. Yes, it’s very pleasant to go to a nearby café and get a cup of coffee with a delicious meal. However, $$ add up and you end up spending way too much that month! Also, if you try to stay on the cheaper side with your lunches, sometimes you just buy fast food. 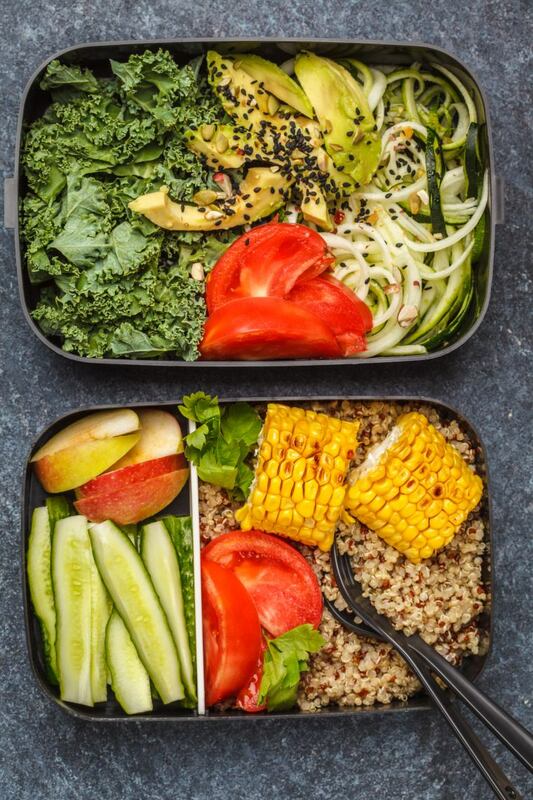 So, start meal prepping for your lunch! Investing an hour to cook lunch for the upcoming 3 days can be life-changing. You’ll end up eating healthier and saving a ton of money. So, do consider making your lunch in advance. Here are food containers that actually seal well. Sodas are both unhealthy and expensive. While bottled water might end up being just as expensive, it’s a much healthier choice! Also, consider investing in a water filter. In that way, you can save money on buying bottled water too. Something as simple as this water filter can do the job. There are a couple reasons why you should eat more beans. One of them is that they’re cheap and delicious! But also, they’re a great plant-based source of protein that’s essential for a healthy diet. Beans also have a big amount of dietary fiber which contributes towards better digestion. So, you cannot lose in any way by eating more beans! There are a couple ways you’re saving money buying products online. First, you save money on gas, because the food gets delivered to your home. Especially since most shops offer free shipping. Secondly, you might come over discounts, especially the ones that are applied when you’re buying products in bulk. Thirdly, it’s much easier to control your urges and stay organized! Some of the latest research shows that Americans waste 150 000 tons of food every day. So, have you asked yourself how many times you’ve thrown away the leftovers? While I don’t recommend becoming a garbage bin and finishing up whatever your children haven’t eaten, you should always try to use leftovers. Either heat them up the next day or incorporate them into freshly cooked new meals. You’ll save a lot of money and help the environment at the same time. 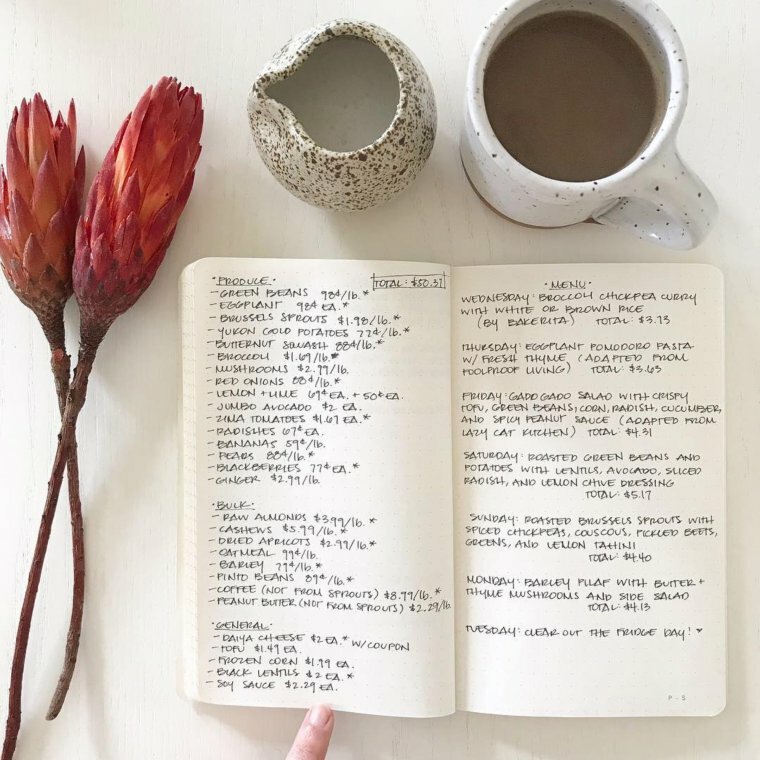 Planning is everything when it comes to living on a budget. It’s very easy to spend more than you’ve intended if you go to the shop without a plan. So, start planning! Make your grocery list before you go to the shop. It’ll also help you to consciously make healthier food choices. A quick tip: always leave a little bit of room for a treat or two! You deserve it. Planning your food for the week can help you to stay on your budget. Mostly because you can play around with the products and estimate your meal costs for each day. It is quite a bit of work but once you get into the habit of planning, it’ll be much easier to save money and eat healthily. Yet again, planning is everything! The truth is – the more time you spend in the shop, the more unnecessary products you’re likely to buy. Shopping once a week can save you from unnecessary expenditures! Also, the more often you go to the shop, the more likely you’re going to get a snack here and there. So, try to do one big shopping once a week, and only get the fresh veggies and fruits when necessary. 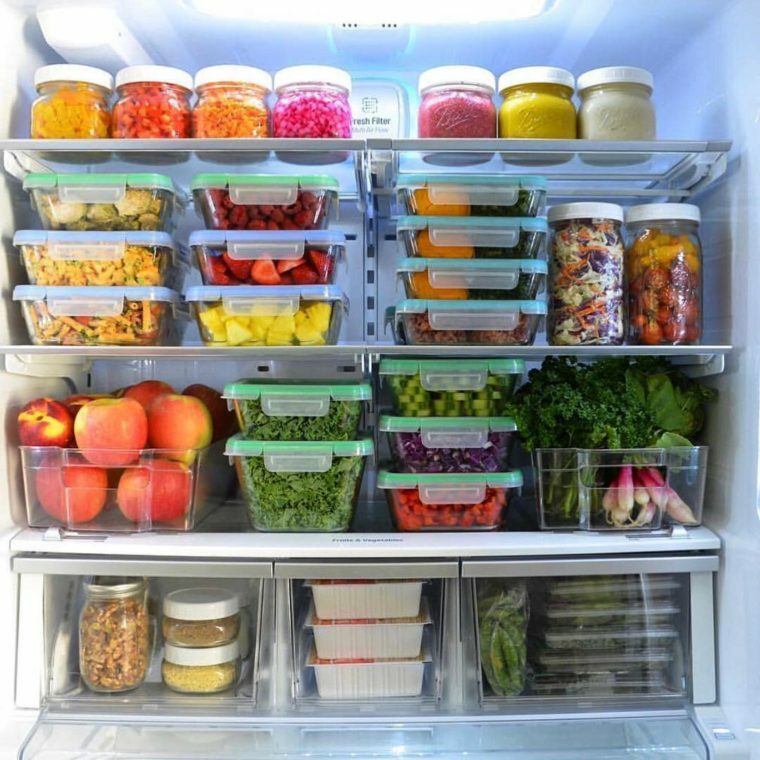 The key to not wasting your food is keeping your fridge organized. So, definitely invest half an hour week to organize your food in order of expiration. Also, make sure you rotate your products. If you get something new, put it in the back of the fridge. Additionally, keep all the older products in front, so they’re easy to reach. Those are the basic rules everyone follows in restaurants where any food waste means losses in revenue. So, get a few plastic boxes and organize that fridge! You can buy a few plastic organizers for your fridge here. These food containers seal very well too. If you are on extra low budget and have to miss out on some of the meats or other more expensive products, incorporate more spices into your diet. The truth is, spices create a lot of flavors that we so much enjoy. I mean spicy chicken is mostly good because it’s spicy! So, make your food more delicious by introducing more flavors. Spices can offer a cheap way to do that, so you won’t even feel like you’re eating on a budget. Buying bagged spices in bulk can save you a ton of money in the long run. Look for offers like this one here. A lot of money can be saved by eating similar foods for a couple days in a row. Meal prep your nutritious breakfast and enjoy it for a couple of days. You can freeze up some fruits for a morning smoothie and have your oatmeal mix prepared for the upcoming mornings. It’s very simple, quick and can save you some cash. Eating the same meal every day for a week can help with using up the products you’ve bought. Because let’s be honest, most of them come in higher quantities, so you definitely don’t want to waste it. When the season comes for your favorite vegetable or fruit, go straight to the farmers market. You’ll be surprised by how much cheaper the products are out there compared to supermarkets. Also, a good thing about markets is that you can always negotiate! Thus, if you buy some foods in higher quantities, you might as well be able to get them cheaper. On top of all that, you’ll know that the products you’re buying are local. So, you’ll be supporting local businesses and getting more nutritious products. It’s a win-win situation! When you are shopping in the supermarkets, try to opt for less known or store brands. Let’s be honest, in the 21st century, the value of a ‘’brand’’ has grown so much that we end up paying more for the name of the product. However, the truth is, most of the time, cheaper alternatives are just as good. So, do yourself a favor and at least try brand products. Freezing up meats and fish can let you make use of discounts and seasons. Especially since these products are on the more expensive side. However, they are essential to a healthy diet. Here the examples of meats you can freeze up and how much they’ll last. The next time you’re cooking chicken, keep your bones. They’re full of collagen which can be consumed and used by our bodies to make our own collagen. In fact, studies show that consuming specific collagen peptides improves skin elasticity. So, use leftover vegetables that don’t taste so well fresh and bones to make a delicious soup that’s also very nutritious. While it might seem counterintuitive to invest into a slow cooker. It’s totally an investment you want to make! Cooking cheaper meat cuts in low temperature for a long time can help to tenderize it. Also, you can leave it on during the night and have your breakfast ready every morning! It also uses less energy than the oven, so you might save some money on electricity too. Here is an affordable and sturdy slow cooker that won’t hurt your pockets. 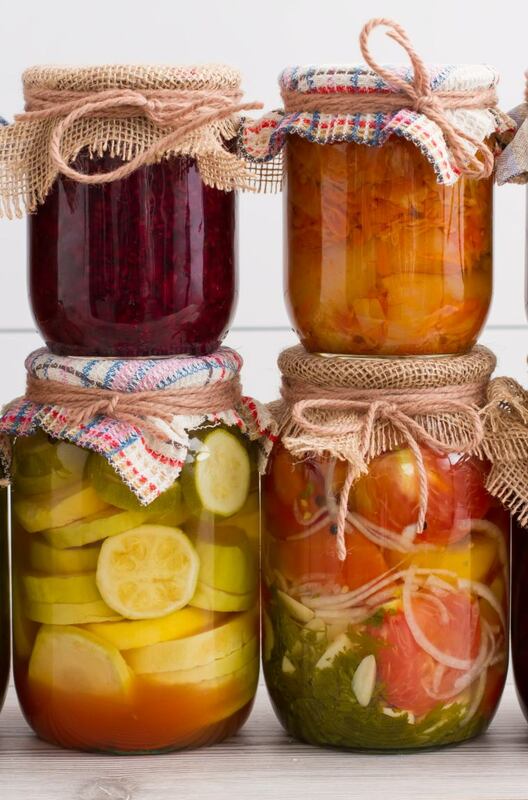 Canning seasonal food is an interesting experience. While I was growing, my family and I used to do that all the time to save money. Also, we couldn’t quite eat all of the cucumbers, tomatoes, berries and apples in one summer. That’s where canning food comes in handy. There is nothing better than eating pickles in the winter which you’ve canned yourself! 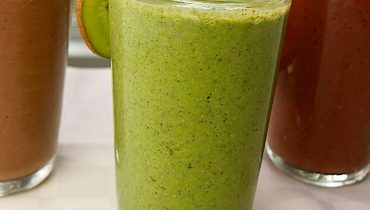 Delicious and nutritious! So, it’s definitely a good time investment both for your health and budget. However, do learn how to do it properly because might end up wasting a lot of food and time for nothing. 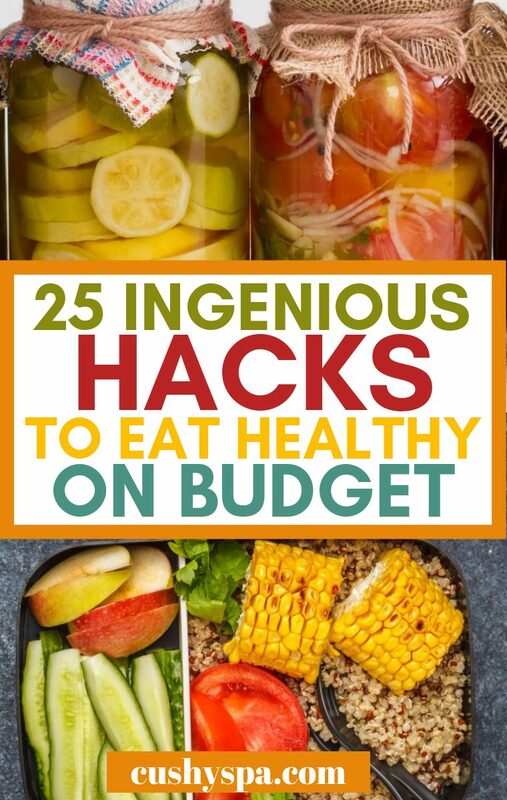 I hope you’re going to use some of these hacks to eat healthy on a low budget! 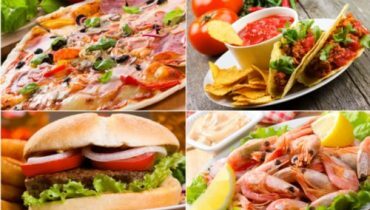 If you’d like to learn more about eating healthier, please check 10 junk food hacks. These might be helpful when you’re craving for fast food!